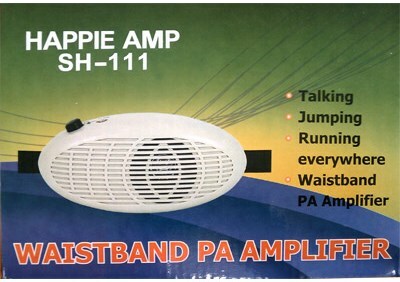 Happie Amp Jr. is a waist-band amplifier with headset microphone. Runs on 6 AA batteries (not included). This system is great for small venues of up to 50 people. Sound quality is good for this type of system, but not the same as using a high quality system such as the Happie Amp 2.0.